To shorten your URL's in your posts, you need to set a URL shortener. How to set a default URL Shortener? How to use Sniply/ Bitly/ Rebrandly with SocialPilot? Select the accounts for which you want to use Rebrandly along with your customized domain names and click on the 'Apply' button. Select the accounts for which you want to use Bitly shortening service with your customized domain names and click on the 'Apply' button. 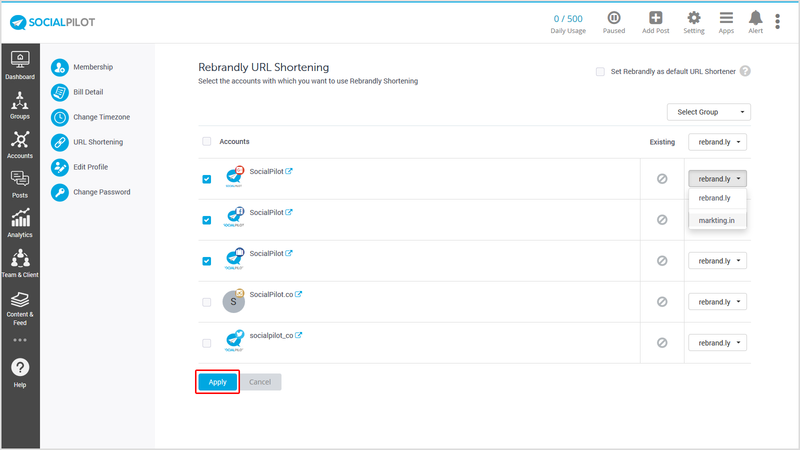 How to set Rebrandly/ Bitly/ Sniply as your default URL shortener? After the authorization process is completed, you will be lead to SocialPilot's Rebrandly/ Bitly/ Sniply page. Click on the checkbox 'Set Rebrandly/ Bitly/ Sniply as default URL Shortener' on the right-hand side. That particular URL shortener will be set as your default shortener.